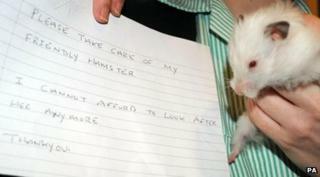 This cute little hamster is looking for a new home after being abandoned with a note saying, "I cannot afford to look after her any more". The white furry creature was found by some bins in London and handed to a Blue Cross animal hospital. 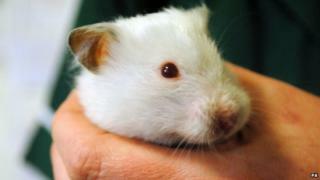 She's been named Snowball by vets and will be taken to a rehoming centre. Blue Cross says it's seeing more pets being abandoned because owners can't afford to look after them anymore. The charity is urging anyone who can't care for their pets anymore to contact an animal rescue centre for help. Amanda Marrington from the animal hospital said: "We couldn't believe it when the man walked into reception with a dumped hamster. "We are more used to seeing abandoned dogs or cats." Where does Tiger Woods' comeback rank among these other amazing returns?